Today we will present the Basic Fantasy Role-Playing Game, and we will do it both in Italian and in English. We answered to the call made by the innkeeper of the Tenkar's Tavern for a Basic Fantasy Role-Playing Game Appreciation Day to be held on the 31st of January. The BFRPG is a D&D/AD&D retro-clone using as model the version of D&D and AD&D from 1978 to 1985 with a streamlining of the rule from 30 years of game experiences. The BFRPG has a lot of selling point, one is the open source design philosophy that permeates all the project, indeed all the file are freely downloadable from the project site basicfantasy.org (specifically from the downloads page), but also all the software used to develop the game (and the files) is open source. For this decision, and for the game itself we have to thank the lead author Chris Gonnerman and everyone contributed to it with the same open source approach. The game is so free that the paper version that can be bough on lulu.com as hardback, perfect bound or coil bound at cost price, furthermore on the lulu.com page the author ask the potential buyer to first download and read the rules and then eventually to buy the paper version. Obviously while all of this is very nice it would be of no interest if the game was not one of the best retro-clone around. The BFRPG is presented in a clear and interesting way. The game system try to capture the D&D Basic/Expert set feel while introducing some AD&D suggestion (like the differentiation between race and class). The game is enriched by a an introduction story that goes from chapter to chapter (a story that you can read here) and a good number of illustration. The game in 152 pages put everything that is needed to play: classes (cleric, fighter, thief and magic-user), races (dwarves, elves, halflings and humans), spells, monsters, treasure, equipment, rules and hints for the Game Master. This would already grant high praises for the authors and contributors. But the game has another great strength, indeed the open source philosophy manifest all its potential in the great number of supplements freely downloadable from the site. In the already mentioned downloads page you will find a really treasure of adventures, optional classes, new spells, ability, quasi-classes, and much more. A real treasure for everyone. Last but not least there is also an Italian Translation of the about 1/3 of the rules, the first 5 chapters of the rules, the download is under the Basic Core Rules Download, or directly here: Italian Translation. More than enough to start playing. I enthusiastically offered my help to complete the translation and I am working with other Italian friends to complete it as quickly as possible. To end this long post I will present a new magical object that builds on an idea already presented in the optional rules, the Spell Channeling Items. 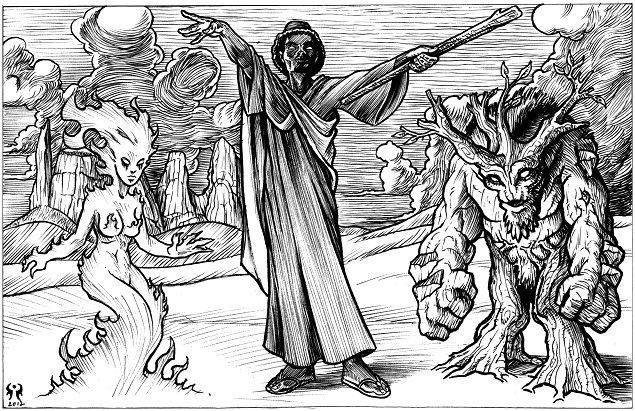 This rule with a simple magical object offer an optional magic system that give a little more flexibility to the classical "vancian" system of the rule set, better yet such a variant magical system can be gradually introduced, experimented with and then introduced or deleted in every campaign (and also in every vancian system, all the D&D and AD&D editions and most of the retroclones), this can be done introducing the magical object as something unique and then if the system is liked making it a simple to create item, all of this without magical point or other complex system. The spell-caster (mage or cleric or other) to use this item will have first to attune with it, to do this the spell-caster will have to meditate over it, while touching it, for a whole week (each day for at least 12 hours, and while doing this he/she can only eat lightly and rest; he/she cannot cast, or memorize, spells, use magical object or engage in strenuous physical activity); after one week the spell-caster will put some of his/her blood (through a small and dolorous cut with no loss of hit points) on the staff to confirm the attuning, then the spell-caster must do a saving throw against spell, if the save is successful the spell-caster has attuned the staff to him/herself, otherwise he/she has just lost 1 week of his/her time. Once attuned the staff the spell-caster can infuse 4+(level/2, round down) spell in it (4 at 1st level, 5 at 2nd, 6 at 4th, 7 at 6th and so on), such spell must be known by the spell-caster and he must be able to cast them, this infusion require 1 day for each spell to be infused in the staff, furthermore the spell-caster need access to all his spell books (except for the Read Magic spell), such infusion procedure can be also used to change the spell present in the staff. E.g. : Ermetelio a 6th level magic-user can put 7 spell into the staff, this spell can be any of the spell Ermetelio can cast, he chose to put into the staff the following spells: Read Magic, Comprehend Languages, Light, Magic Missile, Detect Invisibility, Dispel Magic, Lightning Bolt. Once put the spell into the Staff the spell-caster can use the staff to cast any of the spell into it, to cast a spell into the staff (as for the Spell Channeling Items) the spell-caster must lose a memorized spell of the same or greater level of the spell to be cast, furthermore the spell-caster need the material component for the spell to be cast (not the memorized one). The deep connection between the the spell-caster and the Staff of the Lost Art comport some penalty if the staff is destroyed or lost. If the staff is lost the mage must save vs death or go unconscious for 2d6 hours (1d6 hours if the save is done). If the spell-caster cannot touch the staff for more than one week the attunement is lost and the spell-caster will have a -2 penalty on all roll for 2 weeks, furthermore in this 2 weeks to memorize spell the spell-caster need to make an intelligence check and use his/her spell-book. With this spell the spell-caster can enchant a normal staff in a Personal Staff of the Lost Art. The staff to be enchanted must be of superior crafting and of rare and precious wood enriched with precious metals (the price of such a staff is at least 100 gold pieces) furthermore the spell to be cast need the use of rare herbs and materials (at least 1000 gold piece value in total), to complete the enchantment the spell must be cast for 4 weeks on the staff to be enchanted, during this time this is the only spell the spell-caster can memorize and cast and he/she cannot engage in any strenuous activity. The staff so enchanted is attuned to the spell-caster that enchanted it and cannot be attuned to other spell-caster. If the staff is lost the spell-caster must save vs death or go unconscious for 2d6 hours (1d6 hours if the save is done). If the spell-caster cannot touch the staff for more than one week the staff lose all enchantment and revert back to be a normal staff while the spell-caster will have a -2 penalty on all roll for 2 weeks, furthermore in this 2 weeks to memorize spell the spell-caster need to make an intelligence check and use his/her spell-book. Un'Oscura Minaccia si è risvegliata, Siete pronti a partire? Original Magic the Gathering Art Sale Ends TOMORROW! Hero Kids Creator's Guild coming soon!